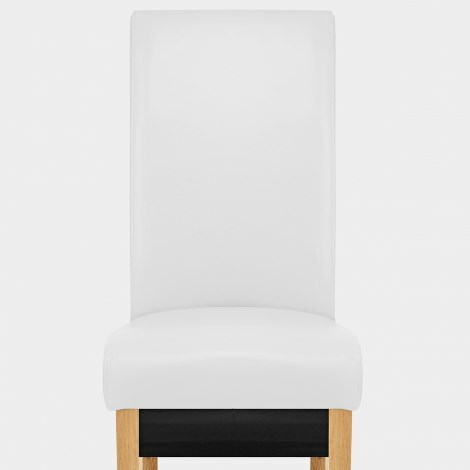 The Carlo Oak Chair White Leather is guaranteed to infuse any room with its trademark blend of lightness and durability. 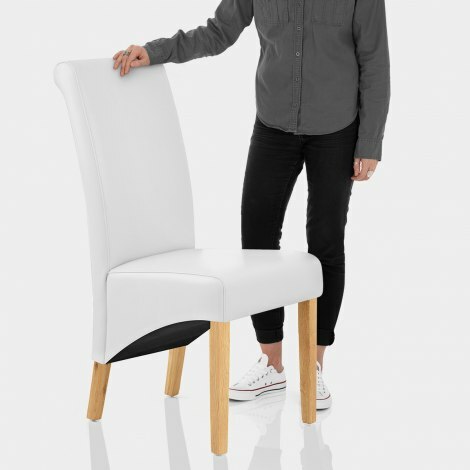 Totally original, this traditional design is updated with crisp and contemporary style, ensuring it is perfect for a multitude of seating areas. The white bonded real leather seat adds a touch of glamour to proceedings, and is padded with high-density foam for your comfort. This authentic component pairs up with a high backrest, supporting your frame with elegance. Meanwhile, a solid oak frame is beautiful to look at, whilst providing a strong and stable base. A cut above the rest, protective pads complete the Carlo and make a strong effort to reduce friction with flooring. "Excellent item; looking great and feels comfortable"
Fabulous chairs that are a great addition to my new kitchen. Delivered quickly and well packaged. Easy to put together. Quality materials. Ordering from Atlantic is very easy. There were no frustrating obstacles. The delivery went smoothly - not long to wait. The chairs are superb and very easy to assemble. I will use Atlantic again and would recommend the company. Good quality product for its price range. Fast delivery and staff went out of their way to rectify a problem that had arisen during transit. The problem was resolved within 48 hours. You won’t find more helpful staff anywhere else. Beautiful chairs, very comfortable and sturdy. Amazing price for leather dining chairs, especially when needing 6! They look so elegant in my dining room. Thank you Atlantic! Speedy delivery! Very happy with quality and look of chairs. Packaging very good and good straightforward instructions to make up. My dining room looks wonderful now.